Will: I thought you hated the holidays. Sue: No, I just hate you. Permalink: I thought you hated the holidays. No, I just hate you. I thought you might wanna put all of out of our misery and shave off that Chia Pet. Will: How did you get in here? Sue: I had a key made ages ago. Permalink: How did you get in here? I had a key made ages ago. 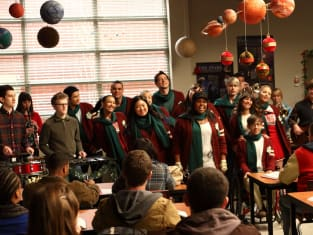 For me, the real joy of Christmas was breaking the collective heart of the glee club. Beiste: She put being husky to good use. Brittany: Was her name Ricki Lake? Permalink: She put being husky to good use. Was her name Ricki Lake? Can't you see how screwed up I am about this? I've had two girlfriends and both have cheated on me. You know what you are, Sue? You're a Grinch. Permalink: You know what you are, Sue? You're a Grinch. William, Elmo, you. Get the hell out of my office. Permalink: William, Elmo, you. Get the hell out of my office. You're a regular Agatha Christie. Except even more sexless. Permalink: You're a regular Agatha Christie. Except even more sexless. I'm everybody's Secret Santa. Yeah, you can just drop those anywhere. You're not the only person at this school that consumes protein powder by the tubful. Just a friend. But on the upside, I'm in love with him and he's actually guy. So we'll call that progress.